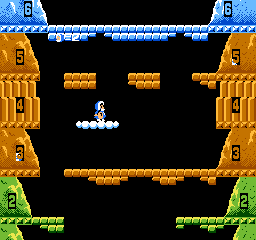 Vs. Ice Climber © 1984 Nintendo. The name of the blue Eskimo is Popo and the pink Eskimo is named Nana. The Ice Climbers (Nana and Popo) were absent from the Nintendo world until their appearance as selectable fighters in Super Smash Brothers Melee (Nintendo GameCube). They both fight as a pair and have moves inspired by the original Ice Climber game. They also have a stage inspired by their game and in the Adventure mode, the Polar Bear and Topi appear as enemies/obstacles. The freezie appears in Super Smash Brothers Melee as an item/weapon. In the US version, Topi (a seal) was replaced with the miniature Abominable Snowman, over concerns of animal cruelty (i.e., seal-clubbing). 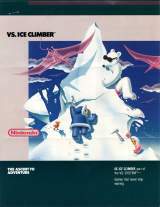 Nintendo NES [JP] (Jan. 30, 1985) "Ice Climber [Model HVC-IC]"